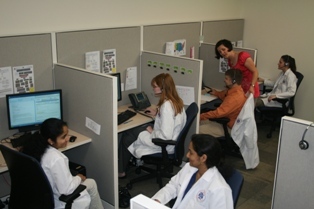 The Center for Quality Medication Management (CQM) at the University of Florida, the first student-staffed MTM call center, was established in March 2010. The center provides an experiential practice site for fourth-year student pharmacists, allowing them to perform comprehensive medication reviews via the telephone, complete patient chart quarterly reviews, and speak to patients regarding adherence issues. University of Florida College of Pharmacy faculty oversee the center's activities and, in keeping with the mission of both the University of Florida and UF's College of Pharmacy, the center is devoted to excellence in research, education, service, and the promotion of health and welfare of the lives they touch. Mission Statement - "Optimizing the quality of medication therapy through education, research, and personalized patient-centered care."